Sports Then and Now | Can Dez Bryant Continue the Dallas Cowboys’ Legacy of Number 88? Can Dez Bryant Continue the Dallas Cowboys’ Legacy of Number 88? 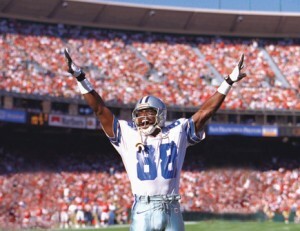 Michael Irvin wore number 88 during his Hall of Fame career for the Cowboys. The Dallas Cowboys made a nice move becoming the first NFL team to have their first round pick from the 2010 NFL Draft signed and ready to start training camp following the signing of wide receiver Dez Bryant to a five year, $11.8 million contract. Too often in recent years, talented college wide receivers have hindered their NFL development by holding out for additional dollars. 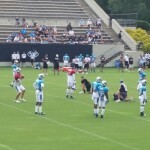 Being able to get Bryant’s contract out of the way should be a positive for both the team and the young receiver. Playing in Dallas and for Jerry Jones is pressure enough, but Bryant will be under extra pressure in 2010 as he is joining a team that expects to be playing for a championship next February. Depending on how you look at it, the Cowboys either put even more pressure on Bryant or gave him an amazing vote of confidence (or perhaps both) by announcing that he would be wearing the number 88. Most teams with a storied history have certain numbers that are special to the franchise. Some teams have chosen to retire many of those numbers, but others have instead been strategic in which players they let wear a number that a previous player in franchise history wore while performing at a special level. For the Cowboys, number 88 is one of those numbers. It is a number that has been worn with distinction not once, but twice by special wide receivers. In the 1970s and early 1980s, Drew Pearson made the number 88 cool for a wide receiver while making some of the biggest catches of his era for the Cowboys. 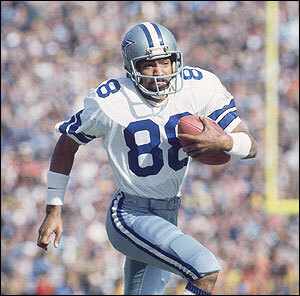 Drew Pearson made some of the biggest catches of his era while wearing number 88 for the Cowboys. During 11 seasons wearing the star on his helmet, Pearson was one of the best receivers in the NFL and the favorite target of quarterbacks Roger Staubach and Danny White. At the time of his retirement, the general consensus around the NFL was that it would only be a handful of years before Pearson received his bust in Canton. Unfortunately, the year after Pearson retired in 1983 with 489 career receptions and an average of 16 yards per reception, the game changed dramatically for receivers. Pearson once led the NFC with 58 receptions and all of the NFL with 870 yards receiving in a season. In 1984 Art Monk became the first receiver since the glory days of the AFL 20 years earlier to catch more than 100 passes and 15 receivers topped 1,000 receiving yards. The role of the receiver was no longer to expand the field and catch 4-5 medium or long passes in a game as was the case for most of Pearson’s career. Instead, wide receivers were used for shorter possession routes and over time the statistics of players like Pearson were suddenly as obsolete as their style of play. So, 27 years after his retirement, Pearson is still waiting for the HOF call that will likely never come. However, he remains a Dallas Cowboy legend and a favorite to all who followed the team during the glory years of the 1970s. Five years after Pearson retired, the Cowboys gave his prestigious number 88 to a brash young receiver from the University of Miami. Over the next decade, Michael Irvin evolved into one of the best receivers in the NFL and was a key player on three Super Bowl championship squads. Like Pearson two decades earlier, Irvin was the primary target for a Hall of Fame quarterback as he joined quarterback Troy Aikman and running back Emmitt Smith to form a superstar offensive trio for the Cowboys. A five time Pro Bowl selection, Irvin eclipsed the 1,000 receiving mark seven times and in 1995 caught 111 passes. 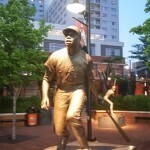 He retired after suffering a career-ending injury during a game at Veterans Stadium in Philadelphia during the 1999 season. 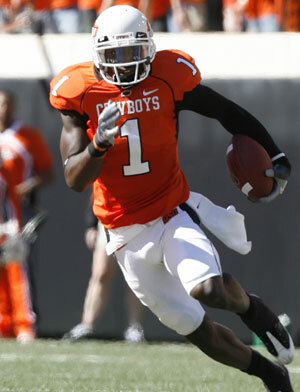 Dez Bryant wore number 1 for Oklahoma State, but will try to live up to the legacy of number 88 for the Cowboys. 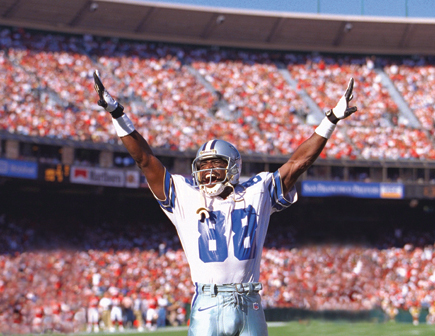 Though Irvin had some off the field issues that cost him a portion of the 1996, his 750 career receptions and 11,904 career receiving yards were enough to earn him a call from the Hall of Fame. Bryant will have to have quite a career to live up to the legacy of number 88, but many believe that he was the best talent among the available receivers in the 2010 draft. What allowed him to fall to Dallas in the 24th spot in the draft were some questionable off-the-field decisions that ultimately ended his college career prematurely. So far, Bryant has demonstrated nothing but professionalism and signing before the beginning of training camp seems to be an illustration of his desire to seize this opportunity. If he is able to come even close to living up to the legacy of Pearson and Irvin then Bryant will end up being quite a steal and creating his own place in Cowboys’ lore. ← Why Isn’t Gil Hodges In The Baseball Hall of Fame?